It's official! 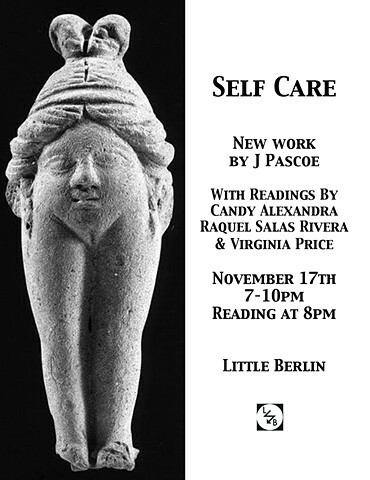 I'm so excited to be sharing space with these amazing poets and book artists as well as Little Berlin's zine library. If you find yourself in Morelia May 22-24, please check out the latest installment of Liber Mundi, a book arts and zine project I helped to organize in late 2015. 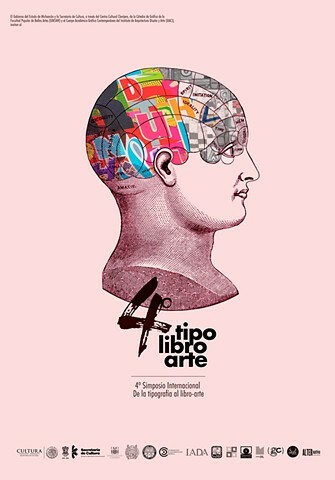 As part of the IV Simposio Internacional de Tipografia y Libro-Arte at the Centro Cultural Clavijera, it's free and should be very interesting! In February I will be traveling to participate in Printing Matter, a thematic artist residency, at Skaftfell Center for Visual Art, Seyðisfyörður, Iceland. It will be a two week residency working with Danish artist Åse Eg Jørgensen and the Technical Museum of East Iceland in exploration of the artist book in printing technique, material use, and binding. The talk will be moderated by Jan Descartes of the Interference Archive and Our Comics Ourselves. I'm going to be working with the Risograph GR1700 for three months making work. Can't wait to dig in! I am very excited to announce the opening of my solo exhibition at Rowan University's High Street Gallery. Come on out and see what I've been doing for the last three months! I was recently interviewed on Paper Cuts -- a podcast about independent publishing, book arts, and zines. It was a lovely experience and my first time on-air talking about what I do! Listen to it here and I strongly encourage anyone to follow everything Paper Cuts does. I had the great fortune to have three pieces accepted into the juried show, Bookish, at Millsaps College, Jackson, MS in collaboration with The Purple Word Center For Book & Paper Arts and a piece in Text & Image at the University of Huntsville Alablama, Huntsville, AL. Check out these great shows while they're still up! I am beyond thrilled to participate in Rowan University's Artist In Residence program! Look for more news, updates, and images from Glassboro, NJ in the near future. Liber Mundi is the newest project that I'm working on -- follow here to keep up with all the updates. 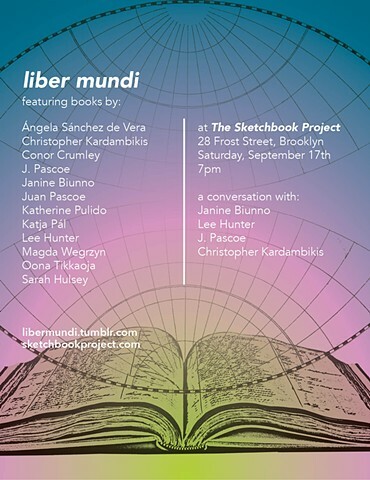 Liber Mundi is a series of artist book and zine exhibitions featuring 14 artists located in various locations around the globe. Liber Mundi explores the act of discovery found in transmission of information via the contemporary book form, artist books, and zines. Each artist will have created an edition size of at least 14 artist books or zines allowing for 14 exhibitions or events to happen around the world throughout Spring 2016. I had the pleasure of participating in PECO Second Saturday at Second State Press recently. Silkscreening, single sheet books, and coloring! Here's a short video of one piece I liked in particular. I'm stepping out as a curator for PHILALALIA this Fall at Temple University. I'll be helping to coordinate the fair's first exhibition and lounge space, to be held at Temple Contemporary, Tyler School of Art. I'm excited for all that this will bring! sidewall project is showing all 12 artists from their first round of exhibitions. Opening July 3rd, they will be up all month at the Irma Freeman Center For Imagination in Pittsburgh. Check it out! More information here. I am so happy to announce that I'll be teaching a Book Binding class at Fleisher Art Memorial this summer. I will also be teaching two separate one-day workshops later in July. Check them out here! PULP ATLAS will also be tabling at the Philadelphia Art Book Fair April 24th and 25th, come check us out! 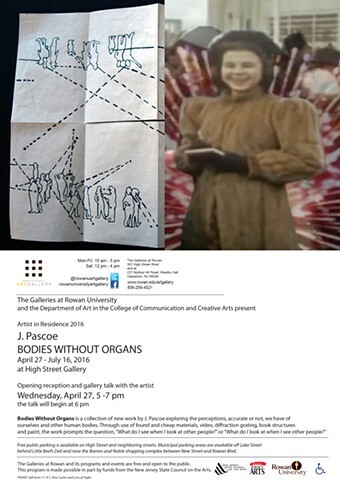 I am very excited to announce I will be with working with art students as a Visiting Artist for the first week of March at the Maine College of Art. Stay tuned for more information and images! I will be showing some new work during the month of February at the Resource Exchange. There will be a reception as well as a workshop open to the public, dates TBD. Come out to grab up some great art supplies at the RE and celebrate my 33rd birthday! PULP ATLAS at The Print Center – December 11th. PULP ATLAS will be shown, for one night only, at The Print Center. Don't miss this great opportunity to spend some time with these publications! For a great way to keep up with everything I've been doing with my art, check out my biannual email newsletter. I'll be creating my first mural this Fall and exhibiting it thanks to sidewall projects in Pittsburgh, Pennsylvania. I'm participating in a traveling group exhibition of artists books called PULP ATLAS. I am really excited to see the finished work of the other artists as there are several whom I've had long standing art-crushes on! The finished collected set of work will be on display at the Philadelphia Free Library Parkway Central Branch from September 29th through November 23rd. Keep posted for other Philly based events and exhibitions at other locations nationally and internationally! There is also an Indiegogo campaign to help offset all costs related to the multiple shows around the US, Canada, England, and Scotland. Check it out! I am incredibly excited about my acceptance into D'Clinic Studios' Mixer Artist Residency program in Lendava, Slovenia. The residency will run from June 30th to July 27th and will result in a final exhibition or presentation and a limited edition artist's book! For more information check out my Indiegogo Fundraising Campaign page here. If you're interested in knowing more about what I've been doing in studio over the last year -- sign up to be on my bi-annual mailing list. I was asked to participate in a last second gallery exhibition with two other amazing female identified artists at the William Way Community Center for the month of March. It's turned into a really strong show based loosely around fiber or fiber-like art work. Thanks for the opportunity William Way! I'm excited to have my very own copy of "Consumer Behavior" by Joseph Wisenblit with my artwork on the cover! View here. I will be making books with Philadelphia Magic Gardens during their monthly PECO Family Jams events, as part of Philadelphia Free Library's "One Book, One Philadelphia" programming. Fun times, ya'll! I'm very excited to have made the acquaintance of the gallery managers at 110 Church Gallery and I will be participating in their RiTUAL. Single Sheet: Book Show opening December. I am so very happy to be part of Philadelphia Open Studios this Fall! While showing some of my most recent work, greatest hits from the last two years, and making available some of my work for sale I will also be hosting South Philly artist Lea Munjone! With Fall nearing I look forward to new beginnings with exciting new jobs: I will begin teaching a Book Structures class at the Tyler School of Art, begin as Conservation Technician at the Wagner Free Institute of Science, and pursue a second session as FOB Holder at Second State Press. Busy, but happy, times! I am very honored to have been chosen as one of 45 artists to exhibit in Vox Populi's Annual Juried Exhibition, VOX IX. This year's exhibition was juried by Hilary Harkness and Hunter Braithwaite. I am very excited, and honored, to show work with nine other amazing artists at the Newman Popiashivili Gallery in New York City as part of the group show Un-Natural Constellations. I will have the pleasure of working with the fine community at Second State Press in Philadelphia as the very first FOB Holder Fellow. For more information on this amazing press, visit their website. Stay tuned for more SSP related news in the near future!